Προπτυχιακές σπουδές στο Τμήμα Ιστορίας και Αρχαιολογίας του Πανεπιστημίου Κύπρου (2001-2005). Μεταπτυχιακές σπουδές στο Πανεπιστήμιο Οξφόρδης (2005-2007), Διδακτορικές σπουδές στο Πανεπιστήμιο της Οξφόρδης (Merton College) (2007-2012), διατριβή με τίτλο "Pyla-Kokkinokremos, Maa-Palaeokastro and the settlement histories of Cyprus in the twelfth centuries BC". Από το 2014 εργάζεται ως μεταδιδακτορικός ερευνητής Marie Curie (Career Integration Grants)για το πρόγραμμα ARIEL, που μελετά τους μετασχηματισμούς στην τοπογραφία των οικισμών και του υλικού πολιτισμού κατά την Εποχή του Χαλκού στην περιοχή της Πάφου. Έχει λάβει μέρος σε αριθμό ανασκαφικών προγραμμάτων σε Ελλάδα και Κύπρο (Παλαίπαφος, Πύλα-Κοκκινόκρεμος, Καλαβασός-Άγιος Δημήτριος, Λευκαντί-Ξερόπολις, Μυκήνες [Ανατολική Οικία]). Τα ερευνητικά της ενδιαφέροντα συμπεριλαμβάνουν: η κεραμεική παραγωγή της Κύπρου και του Αιγαίου κατά την Ύστερη Εποχή του Χαλκού και την Πρώιμη Εποχή του Σιδήρου, η κοινωνική, πολιτική και οικονομική δομή των Κυπριακών πολιτειών κατά την Ύστερη Εποχή του Χαλκού, το ανταλλακτικό εμπόριο στην ανατολική Μεσόγειο κατά τη δεύτερη χιλιετία π.Χ. “Archaeological Investigations of the extra-urban and urban landscape in Eastern Mediterranean centres: a case-study at Palaepaphos” (ARIEL), 2013–2017. A Marie-Curie Funded Project, Hosted at the University of Cyprus, Principal Researcher. “The Palaepaphos Urban Landscape Project”, University of Cyprus, 2006–Present. Project director: Professor Maria Iacovou. Fieldwork assistant director, publication of the Late Bronze Age excavated material. Lefkandi-Xeropolis Archaeological Project, University of Oxford, British School at Athens, 2006–Present. Trench supervisor (2006–2008), publication of the Late Helladic IIIC fineware pottery (2009–present). Kalavasos and Maroni Built Environment (KAMBE), Cornell University, 2012–Present. Special ceramologist. Processing and publication of excavated remains. Tochni-Laksia Archaeological project, University of Edinburgh, 2012–Present. Georgiou, A. (ed.) (2012). Cyprus: an Island Culture. Society and Social Relations from the Chalcolithic to the Venetian Periods, Oxford: Oxbow Books Publications. Von Rüden, C., Georgiou, A., Jacobs, A. and Halstead, P. (2016). Feasting, Craft and Depositional Practice in Late Bronze Age Palaepaphos. The Well Fillings of Evreti. Bochumer Forschungen zur Ur- und Frühgeschichte, Leidorf. Georgiou, A. (2014). “The ‘Canaanite Jars’” in V. Karageorghis and A. Kanta (eds), Pyla-Kokkinokremos. A late 13th century fortified settlement in Cyprus. Excavations 2010–2011, Studies in Mediterranean Archaeology (SIMA) CXLI, Uppsala: Åströms förlag, 175–187. Karageorghis, V. and Georgiou, A. (2014). “Inventory of objects, diagnostics sherds and sherd trays” in V. Karageorghis and A. Kanta (eds), Pyla-Kokkinokremos. A late 13th century fortified settlement in Cyprus. Excavations 2010–2011, Studies in Mediterranean Archaeology (SIMA) CXLI, Uppsala: Åströms förlag, 123–140. Karageorghis, V. and Georgiou, A. (2014). “Commentary on the objects” in V. Karageorghis and A. Kanta (eds), Pyla-Kokkinokremos. A late 13th century fortified settlement in Cyprus. Excavations 2010–2011, Studies in Mediterranean Archaeology (SIMA) CXLI, Uppsala: Åströms förlag, 141–153. Georgiou, A. (2016) “The ‘White Painted Wheelmade III ware’ from the Evreti Wells” in C. von Rüden, A. Georgiou, A. Jacobs and P. Halstead (eds), Feasting, Craft and Depositional Practice in Late Bronze Age Palaepaphos. The Well Fillings of Evreti, Bochum: Bochumer Forschungen zur Prähistorischen Archäologie, 79-182. Georgiou, A. (2016) “The ‘Splash Painted ware’” in C. von Rüden, A. Georgiou, A. Jacobs and P. Halstead (eds), Feasting, Craft and Depositional Practice in Late Bronze Age Palaepaphos. The Well Fillings of Evreti, Bochum: Bochumer Forschungen zur Prähistorischen Archäologie, 183-189. Georgiou, A. (2016) “The Imported Late Helladic and Late Minoan vessels” in C. von Rüden, A. Georgiou, A. Jacobs and P. Halstead (eds), Feasting, Craft and Depositional Practice in Late Bronze Age Palaepaphos. The Well Fillings of Evreti, Bochum: Bochumer Forschungen zur Prähistorischen Archäologie, 191-196. Dikomitou-Eliadou, M., Georgiou, A. and Vionis, A. (2016) “The petrographic analyses of cooking pot samples from Evreti” in C. von Rüden, A. Georgiou, A. Jacobs and P. Halstead (eds), Feasting, Craft and Depositional Practice in Late Bronze Age Palaepaphos. The Well Fillings of Evreti, Bochum; Bochumer Forschungen zur Prähistorischen Archäologie, 235-258. Georgiou, A. (2016) “Cylinder-seal impressions on storage vessels from Maa-Palaeokastro. Elucidating an idiosyncratic Late Cypriot mechanism” in J. Driessen (ed. ), RA-PI-NE-U. Studies on the Mycenaean World offered to Robert Laffineur for his 70th Birthday, Louvain-la-Neuve: AEGIS 10, 125-144. Georgiou, A. (2012). “Pyla-Kokkinokremos and Maa-Palaeokastro: a comparison of two naturally fortified sites at the close of the Bronze Age in Cyprus” in A. Georgiou (ed. ), Cyprus: an Island Culture. Society and Social Relations from the Chalcolithic to the Venetian Periods, Oxford: Oxbow Books Publications, 65–83. Georgiou, A. (2015). “Cyprus during the ‘Crisis Years’ revisited” in A. Babbi, F. Bubenheimer-Erhart, B. Marin-Aguilera and S. Mühl (eds), The Mediterranean Mirror: Cultural Contacts in the Mediterranean Sea between 1200 and 750 B.C. Mainz: Verlag des Römisch-Germanischen Zentralmuseums (RGZM) Tagungen 20, 129–145. Georgiou, A. (2015) “Palaepaphos during the Late Bronze Age: Characterizing the urban landscape of a Late Bronze Age polity” in Z. Theodoropoulou-Polychroniades and D. Evely (eds. ), Aegis: Essays in Mediterranean Archaeology Presented to Matti Egon, BAR Archaeological Series, Archaeopress, Oxford. Georgiou, A. (Forthcoming) “Tracing the foundation horizon of Palaepaphos. New research on the early history of the Paphos region” in S.W. Manning, C.M. Kearns and J.F. Leon (eds), New Directions in Cypriot Archaeology. Georgiou, A. (Forthcoming) “Ceramic fluidity and regional variations: Elucidating the transformed ceramic industry of Cyprus at the close of the Late Bronze Age” in A. Cannavo and L. Thely (eds), Les royaumes de Chypre à l’épreuve del’histoire.Bulletin de Correspondence Hellenique-Supplementary volume. Georgiou, A. (Forthcoming) “Flourishing amidst a “Crisis”: the regional history of the Paphos polity during the transition from the 13th to the 12th centuries BCE” in P.M. Fischer (ed.) The Sea Peoples Up to Date. New Research on the Migration of Peoples in the 12th century BCE, Contributions to the Chronology of the Eastern Mediterranean (CChEM). Karageorghis, V. and Georgiou, A. (2010). “A Corpus of Late Minoan Pottery from Pyla-Kokkinokremos” in Report of the Department of Antiquities, Cyprus, 301–324. Georgiou, A. (2011). “The Settlement histories of Cyprus at the opening of the twelfth Century BC” in Cahier du Centre d’ Études Chypriotes, 109–131. Dikomitou-Eliadou, M., Georgiou, A. and Vionis, A. (2015) “Cooking fabric recipes: An interdisciplinary study of Cypriot cooking pots of the Late Bronze Age” in Journal of Archaeological Science Reports..
Georgiou, A. (2013). “Cypriot Archaeology” (pp. 1892–1893), “Molione” (pp. 4562–4563), “Enkomi in Cyprus” (pp. 2511–2512), “Kition” (pp. 3775–3777), “Koukounaries” (pp. 3815–3817) and “Stirrup jar” (pp. 6396–6297) in R. Bagnall, K. Brodersen, C. Champion, A. Erskine and S. Huebner (eds), The Encyclopedia of Ancient History, Oxford: Wiley and Blackwell Publications. Georgiou, A. (2015) “Eteocypriot”, “Palaepaphos”, “Toumba tou Skourou”, “Maa-Palaeokastro”, “Pyla-Kokkinokremos”, “Hala Sultan Tekke” and “Karageorghis, Vassos” in R. Bagnall, K. Brodersen, C. Champion, A. Erskine and S. Huebner (eds), The Encyclopedia of Ancient History, Oxford, Wiley and Blackwell Publications. Undergraduate studies at the Department of History and Archaeology, University of Cyprus (2001-2005). Postgraduate studies at the University of Oxford (M.Phil. in Classical Archaeology) (2005-2007). Doctoral studies at the University of Oxford (Merton College) (2007-2012). Thesis entitled "Pyla-Kokkinokremos, Maa-Palaeokastro and the settlement histories of Cyprus in the twelfth century BC". Scientist in charge for the EU-funded research programme ARIEL (FP7), a Marie Sklodowska Curie Career Integration grant (2013-2017). 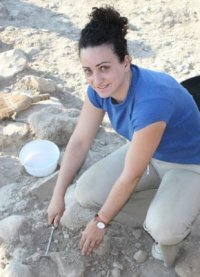 She has participated in a number of archaeological fieldwork programmes in Greece and Cyprus (Palaepaphos, Pyla-Kokkinokremos, Kalavasos-Agios Dhimitrios, Lefkandi-Xeropolis, "East House" at Mycenae ).